For many of us, we remember Thanksgiving as a time for family reunions and big celebrations. It’s a time to reflect and give thanks for everything good that happened this year. Even when you’re job hunting, Thanksgiving should remind you to be grateful for every opportunity you’re given, including job interviews. Thank you letters are sometimes seen as cheesy and unnecessary notes that only annoy recruiters. If your note is tacky and completely self-promotional, that might be the case. But if you know how to write a good thank you letter, you’re already one step ahead of the other applicants. 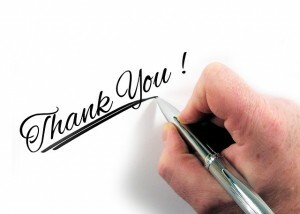 What’s in a Powerful Thank You Letter? As an example, say the interviewer is concerned that you’ve never worked in their industry before, or you’re a fresh grad with limited experience. I hope you sufficiently answered any concerns that arose during the actual interview. Nevertheless, it also pays to drive the point home by reiterating your confidence in the thank you letter. Don’t use template thank you notes. Recruiters and hiring managers receive tons of resume samples and thank you letters, so there’s a big chance that they’ve already seen the common thank you letter formats. If you use an obvious template, it will adversely affect your chances of getting an offer. Whatever you do, don’t hand the interview note immediately after the interview. It seems obvious, but some applicants do this — If you hand it in after you shake hands with the interviewer, it’s obvious that what you wrote is a template. I know I keep telling you to personalize the thank you note. How can you do that? The process is similar to how resume samples are personalized to each candidate. For resumes, the common format for middle-manager resume samples and C-suite resume samples are different because these jobs have totally different goals. So their resumes should reflect that. Thank you notes are personalized by mentioning specific items you and the interviewer talked about. It could be anything from small talk (hobbies, kids, favorite books, etc) to business and job-related goals (increasing sales, building a team, etc). Writing a personalized thank you letter keeps you top of mind for the interviewer. Because most interviews are short, roughly 10 to 20 minutes for most entry- to mid-level positions, there’s a huge chance you weren’t able to mention all your accomplishments and related skills. A well-written thank you note touches briefly on other qualifications that did not come up in the interview, or on your resume. If they weren’t already sold on your other accomplishments, this is your chance to tell them about other successes you’ve had. Your thank you letter shouldn’t be as long as your resume. At most, it should be the same length as your cover letter, about three to four paragraphs. Don’t be tempted to go on and on about yourself. Remember, you are writing this to thank the interviewer for his or her time.